Are you planning to buy a property in Hochelaga-Maisonneuve? Formerly associated with crime and poverty, HoMa is reborn from the ashes: Cooler than ever, this former French-speaking working district is burgeoning, and more and more individuals are tempted by the purchase of a condo unit for sale. 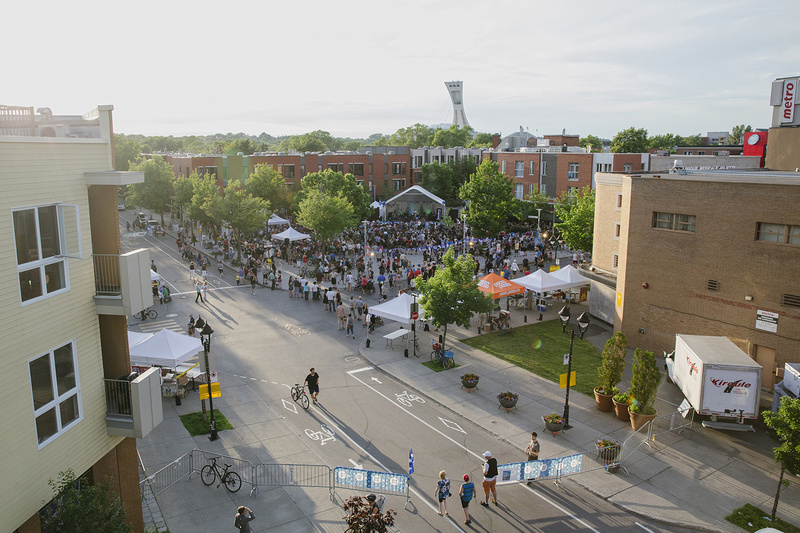 By acquiring a property in this borough of East Montreal, you will discover a unifying neighbourhood, driven by an eco-responsible conscience and the desire to promote local artists and artisans. HoMa was not always the trendy and bustling neighbourhood we know today. Its foundation in 1870 was the result of the area's progressive urbanization, driven by the rapid development of rail and maritime transport. Several companies settled in the area, such as Macdonald Tobacco Factory and Compagnie de chars urbains—a manufacturer of horse carriages. A village at first, Hochelaga graduated to a city in 1883. Its annexation to Montreal happened the same year. Hochelaga was then split in two, and its Eastern part took the name of Maisonneuve. Inspired by the City Beautiful architectural movement, Maisonneuve experienced extraordinary growth. Mostly populated by immigrant and francophone workers with unfavourable working conditions, it is where the Workers’ Party and several unions were created at the turn of the century. However, crippled with debt, the city was annexed to Montreal in 1918. The district suffered from the economic crisis of 1929, but work resumed with the Second World War. In the following years, the Olympic Park and a veteran’s neighbourhood were both created. Over 500 buildings were demolished, and 1300 families evicted from the residential sector in the 1970s, to allow the construction of an east-west highway—a project that never saw the day. Several factories shut down as a result. Community support organizations were created to counter rising poverty and crime. Today, the neighbourhood is an intriguing mixture of young and trendy entrepreneurs attracted by the low price of rents that rub shoulders with descendants of families who have experienced the “deindustrialization.” Hochelag’ is still subject to some prejudices, but gentrification has made it a popular destination for condo unit buyers. Écoquartier MHM encourages Hochelaga-Maisonneuve citizens to take greener habits. Its action plan includes a beautification contest, a series of workshops, cleaning chores, and more. The organism, which has three points of service, promotes composting and urban agriculture as well. Even in the middle of the city, green alleys (or ruelles vertes), another initiative of the Écoquartier, abound. These are far from the sinister backstreets that we see in movies: Well-lit and decorated with hopscotch markings and shrubs, some are even equipped with fine herb garden! It is also a great place to meet neighbours and create a sense of community. There are several parks in HoMa, the most famous of which is probably Maisonneuve Park, perfect for a picnic with family or friends. Shadowed by the Olympic Stadium’s tower, the park is close to Space for Life, a complex of museums that includes the Botanical Garden, the Planetarium, the Biodome and the Insectarium. At the Maisonneuve market, you will find fresh and local produces all year long. If you have hippie roots, you can buy a full-organic grocery at Marché 4751 and Biothentique, and you’ll find everything you need to care for your vegetable garden at Babylone Hydro-Organic. Finally, Terre à soi, the neighbourhood’s general ecological store, will charm you with its loose cleaning products and eco-friendly gifts. Head to Desjardins Avenue, aka Rue de la Poésie, whose trees and gardens are ornate with residents’ poems. An initiative of the Festival of Poetry, the verses invite us to take a break, to be more aware of the world around us, even on a simple stroll to the local dépanneur. A former fire station houses the Maison de la culture Maisonneuve, which offers a series of entertaining events for free or at a low price, including shows, movie screenings, conferences, exhibitions, events… Coincidentally, the theatre Espace Libre also occupies a former fire station on Fullum Street. Although in the Ville-Marie borough, this theatre is on the edge of Hochelaga-Maisonneuve. Lovers of the sixth art will also meet at the Theatre Denise-Pelletier, a local institution. For its part, the Dufresne-Nincheri Museum, located in the magnificent Beaux-Arts-inspired Chateau Dufresne, offers cultural and educational programming all year round. All kinds of events take place at The Esplanade Financière Sun Life. In winter, the Village d’hiver V celebrates snow and winter sports, while spring is the perfect occasion to satisfy your sweet tooth with “Le temps des sucres,” a sugar shack event, and summer brings street food in the spotlight. The Esplanade has already hosted Kent Nagano and the Orchestre Symphonique de Montréal for free music concerts. And what about sport, eh? Head to Saputo Stadium to watch L’Impact play soccer! HoMa may not be the first neighbourhood that pops in mind when it comes to shopping for furniture, but there is an impressive amount of furniture and home decor boutiques to decorate your new property with style. Among these are Montréal Moderne, for Scandinavian-inspired furniture, and Du design, du rétro et du kitsch, where you'll find unique pieces. In fact, many artisans have made the neighbourhood their home. Some even own stores. In addition to its children’s clothing of the same name, Electrick Kidz boutique distributes the adorable creations of local brands such as Atelier Rue Tabaga and Velvet Moustache, while Bigarade sells handmade bedding. Forget big chains, because local and independent shops rule here. There is something for everyone, even comic lovers, who will be crazy about Librairie Z! Ateliers Créatifs, a real estate developer, assists Montreal artists, notably by providing them with workshops in the Chat des artistes building located in Centre-Sud, on the Hochelaga-Maisonneuve border. It is sometimes possible to visit its tenants’ workshops during special events! Some claim that the best coffee in the city is in Hochelag’—not surprising, given how many hipsters live in the area! If you’re craving the perfect latte, there are a few locations to keep in mind, including the Hoche Café (whose sister branch, Hoche Glacé, will become you go-to for delicious ice cream! ), the warm and convivial Café-Bistro Bobby McGee and Anticafé, where coffee is unlimited at a fixed hourly rate. If you have room for more caffeine, head to the Atomic Café, that housed the repertory video club Le Septième until 2013. Hungry? Les affamés takes brunch very seriously. With its colourful stained glass windows, magnificent terrace and cherry wood paneling, Le Valois is a must. As for vegetarians, they can treat themselves to sandwiches and burgers at Antidote Comptoir végane. Want a poutine? Choice is not lacking in the area, but Le Blind Pig is sure to help you get your fix. Finally, grab a drool-worthy baguette at Arhoma to bring home! A stone’s throw away from Madame Smith’s creative cocktails, Le trèfle is a tavern that serves hearty Irish-inspired cuisine and over a hundred beers. Otherwise, go to the microbrewery L’Espace public for the canned beer and festive atmosphere! And if you’re rather have a brewski at home, check out Le bièrologue, a shop that sells local beers, wines and ciders. There are so many good reasons to move to Hochelaga-Maisonneuve. Restaurants and independent businesses abound in this lively neighbourhood that is oriented towards culture and community. Need another excuse to buy a property in the area? On Jacques-Cartier Bridge, or anywhere around it, you will enjoy a breathtaking view of the L’International des Feux de Loto-Québec’s fireworks… Simply amazing. HoMa, the neighborhood of the future? Head for this booming district that is attracting more and more buyers!